The Arapiles Arquitectos Asociados studio has been entrusted with developing this avant-garde construction, the Cajamar technological services building. The building has 5 floors and three underground levels, with a total of 19,600m2 and a capacity for 990 workers. This spectacular project created on the Avenida de la Innovación, Almería, was awarded a special mention at the 8th PORCELANOSA Awards. 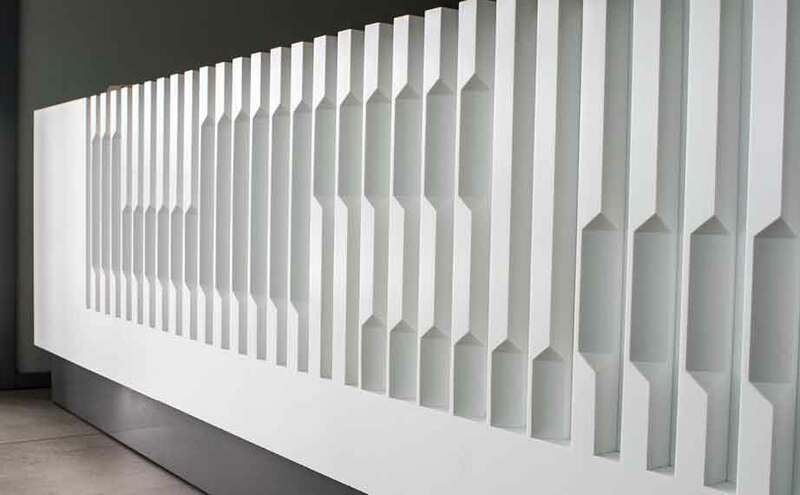 Several of the firms which make up the PORCELANOSA Group participated in this construction, including KRION®, forming the milled, low relief, backlit reception desk. The intrinsic properties of the material give the hall a modern, renewing touch, which our colour 1100 Snow White has blended with the atmosphere of sophistication and functionality of the Cajamar technological building. Thus, great projects are always accompanied by great materials, and the combination of these has allowed Cajamar to have a building with the LEED GOLD certification. This prestigious certification has only been granted to 49 constructions in the whole of Spain and only one in Andalusia. Forming part of this project and helping to achieve this success has been a pleasure for the whole PORCELANOSA Group. Congratuations Cajamar!!! KRION® manipulated by: Hermanos Ibarra.